Hey there! 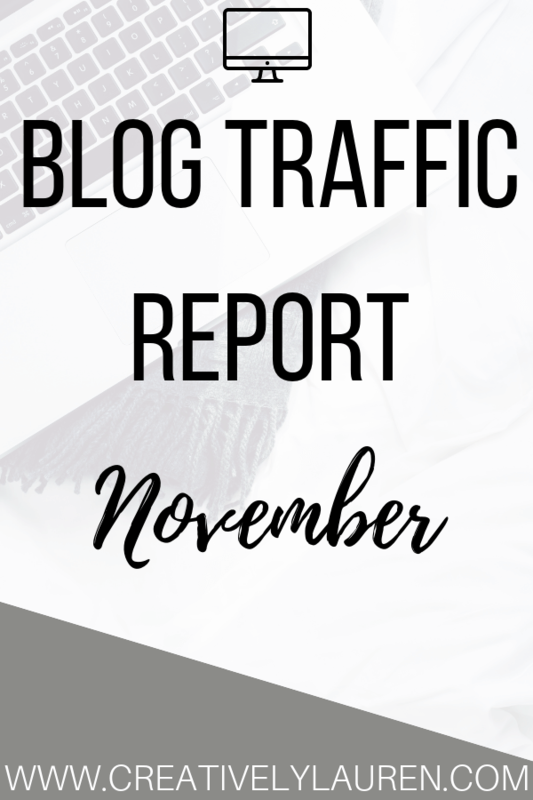 Today I’m sharing my November blog traffic report! This month was pretty exciting for me, I migrated my site to WordPress! After four years on Blogger, I’m hoping that I can further improve my blog on WordPress. This month I had 1,109 users and 1,167 sessions that resulted in 1,502 pageviews. For Twitter, I ended the month with 63,900 impressions and 1,073 followers, which is awesome! I still am using Google Calendar and IFTTT to schedule my tweets for me, but I tried to be more active myself on Twitter. I participated in a Twitter chat which helped me remember that blogging is a community and we all grow with help from each other. I ended the month with 74,443 impressions and 62,553 viewers total for the whole month. That rounds out to an average of 2,481 impressions and an average of 2,085 daily viewers for all of my pins. I also ended the month with 1,862 followers, which was an increase of 72 followers from last month, which is an increase from last month! I also ended the month with an average of 132,777 monthly viewers and 5,656 average monthly engaged users. This is from me manually pinning my pins when I could and then Pinterest just doing the rest. I tried to be good about getting on Pinterest every day because I’m manually pinning. It seemed to pay off this month with Pinterest! I also enrolled in Ell Duclos’ Pinterest with Ell ecourse to try and help boost my traffic from Pinterest. This month I got 174,955 impressions and 161,546 viewers. That means that my pins get 5,832 average daily impressions and 5,385 average daily viewers. This is a pretty big increase compared to last month.